In the past, companies had to deploy a costly enterprise data warehouse, along with data marts, to handle their vast inflows of data, as well as to store, process, and analyze that data. Along with high upfront costs, in-house data warehousing requires distributed, scalable, and reliable IT infrastructure and expertise. While there may be some positives for this type of enterprise data architecture, the costs can very quickly outweigh any potential benefits. Today, far better options exist! Syntelli’s team members, from the data engineers and data scientists to the project managers, are well versed in those better options. Our data engineering services will help any company replace their costly, burdensome in-house data infrastructure and turn their big data pipelines into robust systems prepared for business analytics. We work to ensure your data is in the right place at the right time and in the right format. With the growing audience for analytics, both within a given business and across industries, data engineering will become the linchpin that enables the extraction of value from data. Let us craft that linchpin for your company. Today’s cloud-based systems rely on Apache Hadoop and Apache Spark to store, process, and analyze your data. By storing data with these particular systems, you benefit from a flexible and extensible API and in-memory processing that supports multiple workloads such as batch, stream, machine learning, on-demand caching, and efficient administrative support. Syntelli’s data experts will craft a solution that leverages Hadoop or Spark to improve your big data architecture, and our nearly seamless implementation, close communication, and unrivaled depth of experience will quickly set us apart from our peers. With these Apache systems comes the need for rapid data wrangling, cleansing, optimization, application of custom business rules. Syntelli’s comprehensive data engineering services will meet each of those needs, and power your data with artificial intelligence models, predictive analytics services, and Apache’s Kylin Distributed Analytics Engine. Syntelli also offers enterprise data lake solutions built on top of Hadoop technology. Creating a single store for various data types and structures, Syntelli helps companies kick-start their predictive analytics strategies while eliminating any worry about maintaining expensive enterprise data warehouses. 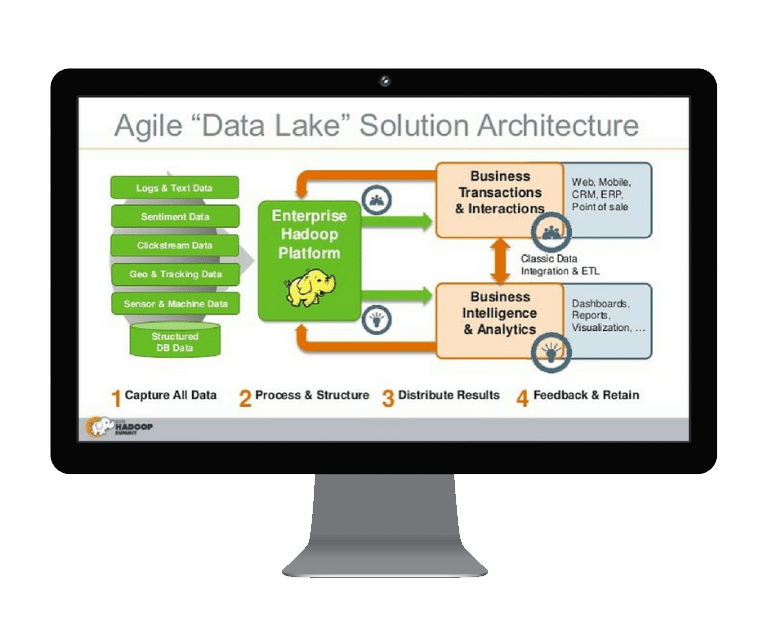 Offering a faster and lower-cost alternative to EDW (Enterprise Data Warehouses), data lakes reduce the time-to-market on new product offerings and instantly power your raw data with predictive analytics and data visualization solutions. Used in conjunction with Big Data and AI solutions, data lakes create an indispensable asset for companies seeking to make sense of diverse data structures and improve the quality, speed, and impact of their business decision-making. Transferring data to an Enterprise Data Warehouse (EDW) enables our consumers to concentrate on the critical areas of their operations, instead of struggling to build and maintain an in-house IT infrastructure. EDW solutions also enable significant cost savings by allowing companies to shift money from the costly capital expenses associated with developing and maintaining that infrastructure to other operating expenses. Built on an agile integration approach that overcomes data complexity and efficiently manages diversity, EDW solutions provide companies with timely and location-independent access to their data, ensure efficient utilization of storage resource, and leverage business insights generated by hosted analytics solutions. All these benefits come with improved data security, backup, and recovery management to create fault-tolerant data warehouses. Syntelli offers BI reporting and dashboard visualizations via TIBCO Spotfire, Tableau, QlikView, and Microsoft Power BI. Thanks to Syntelli’s comprehensive support, you will be able to create powerful visualizations and reports in just a few clicks. These reports will generate valuable insights for your organization, help make difficult business decisions, and drive growth. Our data visualization solutions support a wide variety of formats and data structures. The software we use makes it easy to see relationships and patterns in your business activities, identify emerging trends, and more deeply manipulate and interact with your data. Turning your data into intuitive and informative charts and graphs will help to simplify the process of making data-driven decisions and will improve communication of business insights to your employees and clients. Want to learn more about our data engineering capabilities or the real-world customer success stories we’ve created? View a list of our most recent Innovation Projects.